Students enjoying watermelon from the West Elementary garden. 3rd-5th grade students enjoy building in Construction Club. West Elementary was built in 1969. In1999, there was an addition constructed that consisted of art and music classrooms and a new gymnasium. 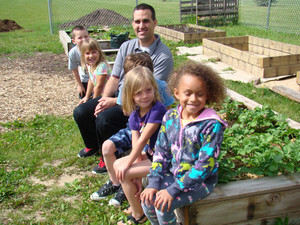 West Elementary is one of the few elementary schools in the state that has its own garden. This garden is maintained by our students with the guidance of the master gardeners of Jefferson County. West offers tremendous opportunities to our students in the technology field. We have wireless access in our building, Smart Board technology in all of the classrooms, and a fully equipped computer lab. Our building houses two to three classes at each level, kindergarten through the 5th grade. At present our enrollment is 290, with an average class size of 22 students.